Centennial Book of the Cathedral Church of St. Luke, which chronicles the history of the first 100 years of the Cathedral Church of St. Luke. The church is located at 130 North Magnolia Avenue in Dowtown Orlando, Florida, and was founded in 1867 by Francis W. Eppes (1801-1881), the nephew of Thomas Jefferson (1743-1826). The congregation originally worshipped in a log cabin and services were conducted by Eppes, despite his status as a layman. In October 1882, William Crane Gray (1835-1919) was elected and consecrated as the first bishop of the Missionary Jurisdiction of South Florida, which included Central Florida and Orlando, at the time. A new church building for St. Luke's was erected under Reverend C. W. Ward during that same year. The building was enlarged in 1884, and again in 1903. On March 31, 1902, Bishop Gray designated St. Luke's as the official Cathedral Church for South Florida and appointed Reverend Lucien A. Spencer as the cathedral's first dean. In 1922, the cathedral building was relocated to make room for a new cathedral designed by Frohman, Robb, and Little of Boston, Massachusetts. During that same year, the Missionary Jurisdiction of South Florida was admitted to the General Convention of the Episcopal Church as the Diocese of South Florida. On April 13, 1925, Bishop Cameron Mann laid the cornerstone. However, as the land bust struck Florida in 1926, the building remained only partially constructed and a temporary wall was built to seal the altar side of the church. Over the years, the building has received a number of structural additions and renovations, including an educational unit memorializing members of the congregation who died serving in World War II; the Chapter House erected in the 1950s; the renovation of the cathedral nave, the erection of the choir gallery over the narthex, and the installation of a 88-rank pipe organ in the early 1970s; and the removal of the temporary wall and the competition of the building's original design during 1986 and 1987. In 1970, the Diocese of South Florida was divided into three smaller dioceses; St. Luke's became the Cathedral Church for the Diocese of Central Florida. Original book: Centennial Book of the Cathedral Church of St. Luke, Orlando, Florida, 1874-1974. Orlando, Fla: Cathedral Church of St. Luke, 1974. Digital reproduction of original book: Centennial Book of the Cathedral Church of St. Luke, Orlando, Florida, 1874-1974. Orlando, Fla: Cathedral Church of St. Luke, 1974. Orlando Remembered Exhibit, Regions Bank, Orlando, Florida. Orlando Remembered Collection, Orlando Collection, Orange County Collection. RICHES of Central Florida. Originally published by the Cathedral Church of St. Luke. Donated to Orlando Remembered by Daniel B. Smith. Copyright to this resource is held by the Cathedral Church of St. Luke and is provided here by RICHES of Central Florida for educational purposes only. 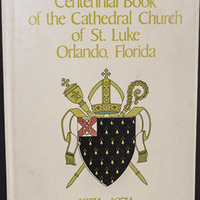 Centennial Book of the Cathedral Church of St. Luke, Orlando, Florida, 1874-1974. Orlando, Fla: Cathedral Church of St. Luke, 1974. "Detailed History." Cathedral Church of Saint Luke. http://www.stlukescathedral.org/History.html/History.html/History_detailed.htm. Church Records and History, 1900-1992. Salt Lake City, Utah: Filmed by the Genealogical Society of Utah, 1993. Wilder, Beatrice. Diocese of Central Florida Churches One Hundred Years Old and More...Through 1993. Salt Lake City, Utah: Filmed by the Genealogical Society of Utah, 1993. Bentley, George R. The Episcopal Diocese of Florida, 1892-1975. Gainesville: University of Florida Press, 1989. 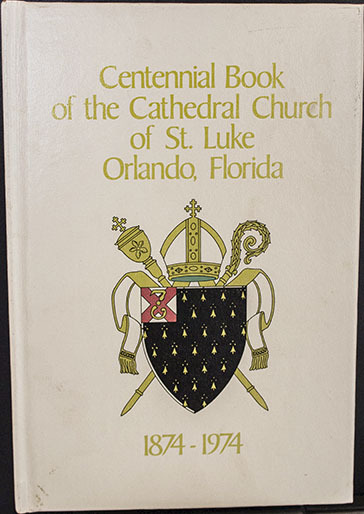 “Centennial Book of the Cathedral Church of St. Luke, Orlando, Florida, 1874-1974.” RICHES of Central Florida accessed April 26, 2019, https://richesmi.cah.ucf.edu/omeka/items/show/4068.